There are 33 reviews of RSVP. 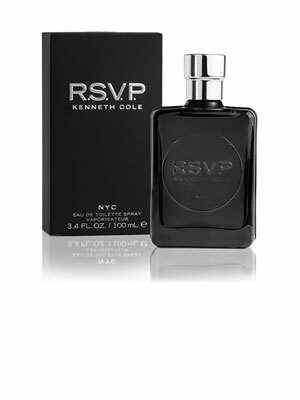 Kenneth Cole's RSVP has a really special quality to it which I gleaned from several reviewers on this and another site, and when I bought and sprayed this, I got the same experience. RSVP does have a woody, creamy and spicy quality that is quite pleasant on my skin. Lavender, iris and orchid provide a brighter floral-spice lift, and the finish is fantastic with the smooth, warm touch of cashmere woods, sandalwood, patchouli, and lavender. It makes me feel at ease, never becoming cloying. RSVP is friendliness in a bottle, welcoming the prospective user to its world of woody-spicy-creamy delights. Glad I got my bottle (opinions seem sharply divided on this one: C'est la mankind :-). Kenneth Cole RSVP (2006) was hot on the heels of Frank Voekl's Kenneth Cole Signature (2005), which itself was a woodsier reorchestration of the garish and misunderstood Kenneth Cole New York Men (2002) made by Steve Demercado, meaning that RSVP was the culmination of this more-oriental train of thought but with Cole's trademark grapefruit house note stapled on. I go against popular opinion among male fragrance aficionados, as I rather enjoy Kenneth Cole's fairly unique grapefruit-powered 2000's masculine output. "Colognoisseurs" used to their expensive niche or esoteric and often discontinued vintage designer fragrances often forget that a "house note" tying all of a perfume maker's creations together has been employed since antiquity by even distinguished like Guerlain, and if Kenneth Cole is to blame for anything, it's that his love of dry woodsy grapefruit accord over (mostly over cypress) was very "en vogue" during the decade he used it most, and sometimes worn a little too much on his sleeve as a house note, but thankfully it's actually quite subdued here in RSVP. I'm not trying to paint RSVP as a hidden gem; it isn't anything more than a soft woodsy amber oriental take on the main Kenneth Cole masculine theme, meant for romantic or evening use where others from the line won't do, unlike the more-formal Kenneth Cole Signature or casual Kenneth Cole Reaction (2004). Besides, Frank Voelkl made this one as well as all those named (outside of New York), so it's only natural that they all share similar chemistry. RSVP opens with that Kenneth Cole grapefruit/cypress note you either love or hate, and from the looks of things, mainstream fellas love it but more refined noses consider it a cheap shot like the reuse of aerial dogfight stock footage in an old WWI movie. I get it guys, this is phoned-in but for me it's a well-done kind of phoned-in performance, like a rehearsed live band performance for Saturday Night Live. Pepper and sweet lavender finish the brief and soft opening that then moves into a heart of iris and cedar, which gives RSVP most of it's quietly romantic poise. The cedar overtakes the synthetic iris note, the latter of which is another soapy love or hate note among male fragrance fans, with a synthetic "orchid" accord filling the gaps in a floral equivalent to what the "fern" accords at this time also were. The base of amber, vetiver, sandalwood, patchouli and musk feels more natural and cozy, while the synthetic cashmeran give the citrus, iris, and woods a plush bed of pillows to land on. I can see how the trail of this can garner compliments if that's why you wear fragrance, but for me it feels like RSVP goes for a tobacco-less take on Versace The Dreamer (1996) with the iris note, but then ads in a hefty cedar to dry it up before ending in an ambery base that mimics Gucci Pour Homme (2003), but stuffs it full of synthetics to lighten it up. Tom Ford was still a year away from his Tom Ford for Men (2007), which would really steal the show away from mid-tier ambers like RSVP, at least until Dolce & Gabbana The One For Men (2008) came along to become the middle-road amber darling, robbing RSVP of any chance to redeem the Kenneth Cole house, but for the price I still maintain that you can do worse. RSVP briefly wore a unicorn horn in it's original red glass presentation (which had wood box coffret to boot) after it failed to market well and was cut, but unlike other big designers that leave discontinued dark horse faves for dead, Kenneth Cole actually relaunched this with a black bottle. Some really overzealous folks will try to tell you that this is better in vintage, but this composition doesn't really rely on many natural ingredients and I doubt the sandalwood was real even at it's launch, plus whatever oakmoss there may have been didn't come through on the older stuff nor feels missing in the newer juice. This is pure Ross and TJMaxx territory here, so for fans of musky and woodsy ambers who like discovering surprisingly well-composed cheapies, Kenneth Cole RSVP might grant a small thrill for the price of a meal at Red Lobster. I find it to be solid, likable, and rounder than most Kenneth Cole scents I own or have tried, but not a huge standout in this genre even at this price point since it's higher-class peers of the day have joined it like brothers-in-arms down in the discount bins of Marshall's and can be had just as easily for the same price as RSVP. Still, fans of Kenneth Cole will find this among his best early output, while everyone else not already riding the hate train on this will find it to be a competent, if somewhat beige-in-delivery romantic semi-oriental scent that gets the job done with fair performance when you want a little sauve in your step but not enough to look like you're trying too hard. Decent longevity here, but wears close to skin after a few hours. For evening use only! I don't agree with all the negativity on this one. Sure it smells synthetic, but what did ya think, it's Kenneth Cole for Pete's sake. I'm not gonna write up a huge review on this one, I just wanted to give my thoughts. It smells like Ck Euphoria, without the nasty suede note. It smells even more so like Daddy Yankee for Men, but not as good. So it falls somewhere between the 2 for me. There's an interesting leafy green note in here, maybe papyrus? it's the same note used in Kenneth Cole Signature, and in Cereus #4, although it's masked mostly in RSVP with an array of synthetic sweet and woodsy notes. It's been rereleased recently, so I got a bottle for like 30 bucks. Not worth more than that though. Get Daddy Yankee instead, it's much cheaper, bottle is tacky, but who cares.. it's cheaper with a much better dry down. An heirloom sits at the foot of a bed. Your grandmother's old chest. A window's bright daylight hits it on both sides. It makes it seem unreal. It has even been passed down to her, from her grandfather. He built it himself by hand, with wood from a tree he chopped down. Even though you know it now just holds blankets, you always check it. Thinking something different will be inside, something grand. Kind of spicey. Not much to write about on this one. The best thing about this one is the box (wooden). If the scent was as good as the box, this would be pretty good. This is an interesting fragrance. It’s a gentle, woody, slightly creamy, slightly sweet, but still a masculine smell. It reminds me a bit of a cross between Baldessarini Ambre and Eau des Baux L`Occitane. On first application I got a nice strong sense of spice and fruit, but that very quickly gave way to the cedar and sandalwood. Within about 20 minutes I swear I could already detect the start of the woody, vanilla & musky drydown; but it still stayed predominantly woody. After that I really couldn’t detect too much other than a close, musky, mild, woody skin scent. However, for a seemingly gentle and low key scent, it’s certainly gets a lot of compliments. The first time I wore this to work, the woman I sat next to on the bus in the morning lent over and asked me what I was wearing, saying that I smelt delicious (30 minutes after application). Later that day when I went into the copy room at work before lunch (about 5 hours after application), the boss’s PA also said that my cologne was delicious and wanted to know what I was wearing! Then when I was out buying lunch, the woman behind the counter at Subway asked me what I was wearing. You guessed it; she said that I smelt delicious. I kid you not, this all happened on the one day. I honestly didn’t think that much of it or that it projected that well, but obviously it does have very good sillage and the longevity isn’t too bad either. Considering that this can be found relatively cheaply, I would recommend for anyone who likes easy to wear, sweet/woody masculine fragrances (and definitely for those of you who want to be thought to smell delicious!). Kenneth Cole R.S.V.P. Men Eau de Toilette EDT 1.7oz./50ml. NiB! There are no member images of RSVP yet. Why not be the first? Kenneth Cole RSVP new formulation?